I do not claim to have created this one! But why re-invent the wheel when this one is the best?! Use words AND images to describe your business model building blocks to enhance big picture understanding. Increase the clarity of your business model by colour-coding all elements related to a specific client segment. Don't fall in love with your first idea. Sketch out alternative business models for the same product, service, or technology. Start from a blank Canvas when you explain your business model. Tell your business model story one sticky note at a time. ​Map out every new and innovative business model you come across. Understand, learn and try to apply to your model. Calculating the size of the prize. Being able to quantify the size of the prize for your market is absolutely imperative to understanding your business plan. What is the size of the market? Which are the biggest segments? Which are the most profitable segments? Which areas are in growth/decline? Which areas do I have the most right to win? All of these questions feed into the calculation of "What is the size of the prize?" or "How much revenue is out there for me to take?". This is no easy task, but I have created a model to help break down the steps involved in the calculations and understand which area of the market to focus your business plan on. What are the details on the different market segments and which ones I will target? Is there an increasing or decreasing amount of competitors? Why do I have a right to win in this market? Where do I have differentiation vs. competitors? How does the Size of the Prize model work? Get the top level market data - what is the size of the market, how much is it worth, is it growing or declining. Get the data on the top market segments - how many people in each one, how much are they worth, are they growing or declining? Compare this to your company data (if existing company) or your projected plan (if new start-up) for the same segments - what % of your business are they for you in volume and value, and are they growing or declining? Input your Current Strength and Future Strength for each segment. This is an attempt to quantify your "right to win" in each segment and should be based on the most important motivations for each segment. This could be brand awareness, distribution, product or service innovation etc. Top level market insight into which segments are growing - and based on market growth data what the future size of the prize is rather than just current estimations. Benchmarking of your company performance vs. market performance i.e. where am I under-performing vs. the market and where am I over-performing. Current size of the prize estimations = based on your current strength and current segment size what is the maximum value in each segment for you to go after. This is useful for strategic focus in the short term - 12 month business plans. Future size of the prize estimations = based on your future strength and future growth trends what is the maximum value in each segment for you to go after. This is useful for strategic focus in the medium-long term and 1-5 year business plans. Graphical comparisons of Current Size of the Prize vs. Future Size of the Prize estimations for each segment. In the example here, based on current strength and size Segment 2 would be the biggest short term opportunity, but Segment 1 holds the biggest future opportunity. Visual respresentation of which is the biggest Future size of the prize for you to go after i.e. in the example here Segment 1 holds the biggest opportunity for the future of this companies business plan. Detail on the input definitions. All key financial KPI's and not just top line sales i.e. revenue, gross margin, EBITDA, closing cash. Various scenarios to show that you are not just planning for best case: include worst case, base case and stretch case scenarios. Depreciation of assets if applicable. And many more... use which are relevant to your business case. 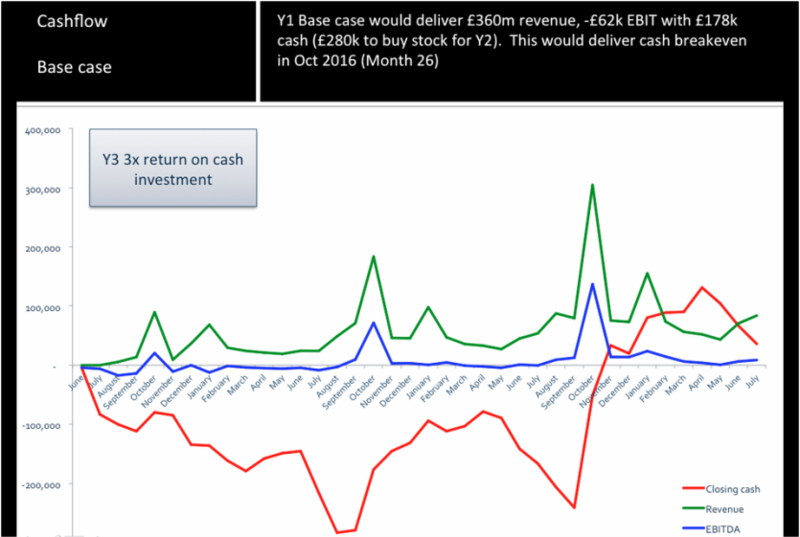 For each business case, a simple way to clear on the cash break even point is to chart out the revenue, EBITDA and closing cash over the first 3-5 years.